Occasionally, in the course of my work as a builder, I come across nature amidst the man-made structures that I’m working on. Typically, it takes the form of a dead rat or mouse, or an abandoned nest in the roof eaves – either a bird’s nest or the complex and impressive wasp nests hanging from rafters in the dark. 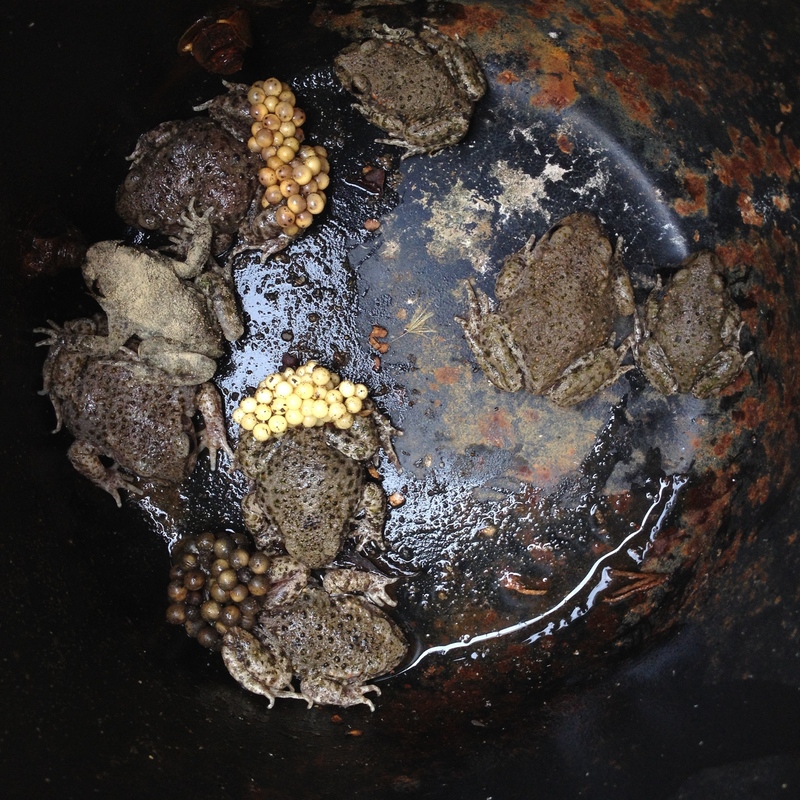 Recently I lifted some paving slabs forming a step out onto a patio and discovered not one but nine small toads huddled nervously in their, up until now, safe hideaway. Three of them had attached to their rear ends a ball of white eggs or spawn, females I presumed. Puzzled by their small size and excited by the fact that they were toads and not frogs I quickly collected them up and removed them out of harm’s way. I don’t think I’ve found toads in Hertfordshire before, although I haven’t been out specifically looking for them, and certainly wanted to preserve these as their home was about to become part of a new extension sub-structure! I mentioned the re-location to the owner and with a knowing look she proceeded to tell me how these little ‘critters’ had driven her and her husband up the wall when they first moved in with their unusual call sound. At first they had thought that one of their mobile devices was beeping or some other electronic device but searching high and low they drew a blank. It wasn’t until their neighbour explained that it was most likely the local population of beeping ‘Midwife Toads’ that they solved the mystery. I noted as she recounted the event that it was clear that she did possess a love for these creatures and I was thankful that I had made good their escape before telling her of my discovery. Feeling my research was better continued away from the scene of the crime I Googled ‘Midwife Toads’ and soon was listening to the strange beeping of these small toads. My instant thought was ‘are they rare?’ and the answer is ‘not really but they could be described as locally common.’ I had certainly never seen them before and they were clearly distinct from the Common Toad which I had seen on previous occasions elsewhere. As it turns out, they are another successful foreign invader to our land, cropping up wherever they have been introduced – first in Bedfordshire over a hundred years ago and now in St Albans and other nearby localities. It also turns out that they are technically a member of a frog family (Alytidae) and not a true toad (family Bufonidae) at all! 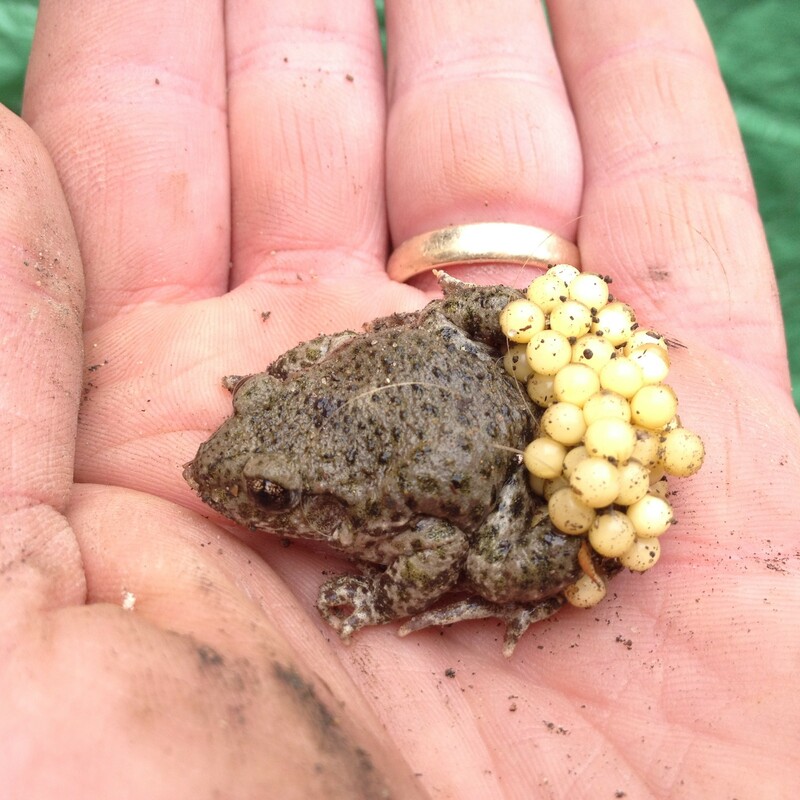 Not only that but the two toads carrying eggs were most likely males and not females as I had presumed. The males take the eggs from the females after copulation and then can continue mating carrying up to three balls of eggs. I’m sure such an arrangement would suit other female species I can think of too! So if you ever hear an unfamiliar beeping in your garden or even your house, think twice before re-charging all your electronic devices. It might just be a pregnant male toad-frog!